Susan Edison moved from Ohio to Dallas, Texas in 1981, where she opened her own Illustration studio for over 30 years. Before that, she was art director of WKRC-TV(ABC) News in Cincinnati, where her court sketches appeared repeatedly on ABC Network shows like ABC World News Tonight, 20-20, and Good Morning America. Over the years Susan won numerous awards as an illustrator. She has done everything from childrens’ books, gardening and cook books, advertising brochures, catalogues and ads, portraiture, collector plates, to fashion illustration. Some clients have included Macmillan, Harcourt Brace, Simon & Schuster, JCPenney, FedEX/RPS, Visa, Pier 1, TGI Fridays, World Trade Center, Mary Kay, and Neiman Marcus. In 2001 Susan created her own line of cowgirls and western art, under the company name Diamond M Ranch Designs. Painting in acrylic glazes, she moved bold color with energy in a stylized realism. Plum Sassy Cowgirls, a tribute to the spirited and tough cowgirl, has been displayed in the National Cowgirl Museum and Hall of Fame and the Montana Historical Society Magazine cover. She was also honored to be the official artist for the Women’s National Finals Rodeo. Susan’s cowgirls have graced the cover of Cowboys & Indians’ W&E cover, as well as being featured in Western Horseman. She is the exclusive fashion illustrator for famed western designer Patricia Wolf. Susan was also commissioned as the official artist for the 2011 Road to The Horse painting. Several years ago, Susan began painting for galleries. 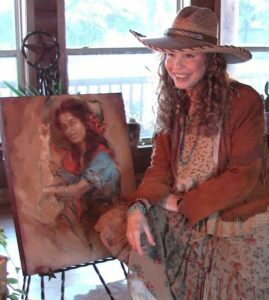 She now paints in oil, her subjects ranging from working cowgirls, cowboys, to horses, donkeys, buffalo’s, and hummingbirds. She also does commissioned portraits. In 2013 her painting, “Dallied Up” was commissioned by the Women’s Professional Rodeo Association for their 65 year commemorative anniversary poster. She is currently represented by The Adobe Western Art Gallery, Fort Worth, Huey’s Fine Art, Santa Fe and Davis & Blevins Main St. Gallery, Saint Jo, TX. 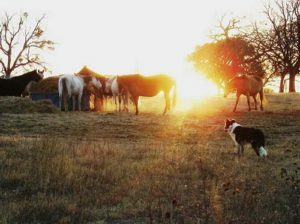 In 1992 she and her British husband started the Diamond M Ranch & Cattle Co. It’s now home to a cow/calf Angus & Brangus operation, as well as breeding reined cow-horses, standing their stud Strait Silver Badge. Susan currently works out of her log home studio along with her 5 dogs on their 2400 acre ranch 70 miles north of Dallas/Ft. Worth.